In this week’s column, I’m going to break down the top prospects, both skaters and goaltenders, for the future of the organization. The success the Islanders have had this year has relied largely on organizational depth following the successful offseason Garth Snow and the front office had, adding both proven NHL talent in Nikolay Kulemin and Mikhail Grabovski, but fringe talents such as Harry Zolnierczyk and Cory Conacher as well. The depth will be tested greatly during the upcoming weeks with the injuries to Casey Cizikas and Kyle Okposo, leading to today’s reunion with Colin McDonald. With that said, the front office has set the organization up with some serious depth in the future via draft picks, and as an Islander fan I’d be excited for the next crop of young players to make their way through the system. Going into the season the Islanders were stacked with defensive system depth with six defensemen making their full time professional debuts. After two trades where defensive prospects Ville Pokka and Andrey Pedan were shipped off, the defensive depth within the system is among the best among the NHL. As far as system depth at forward, the Islanders have a good mix of older veterans and future depth forwards. With past prospects like Brock Nelson, Anders Lee, and Ryan Strome graduating to the NHL level full time, I am perfectly content with having veterans like Colin Mcdonald and Cory Conacher waiting for a phone call in Bridgeport. Depth at goaltender is a whole new story for this franchise. With a full time NHL goaltender in the crease keeping things on Halakdown, it has become possible to stockpile a few young net-minders both from Europe and the NCAA. With time to develop, there may be a hidden gem among them to save the day and solve the backup goaltending issue that Chad Johnson has created. At this point I believe that Pulock has the slightest edge on my second ranked prospect, Griffin Reinhart. 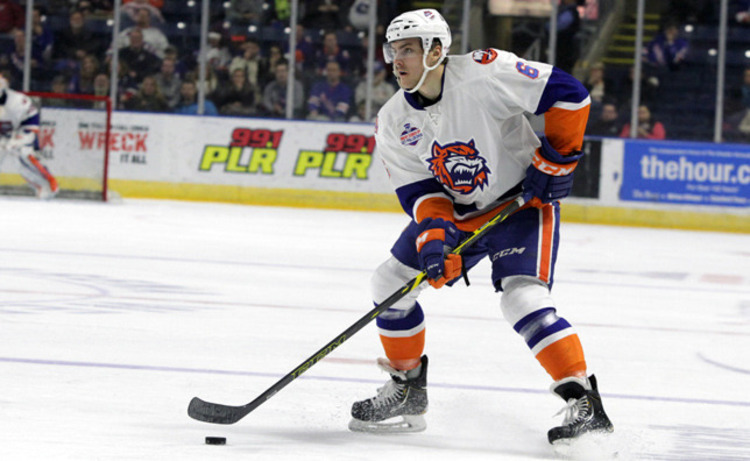 Pulock has put together an impressive rookie season for the Bridgeport Soundtigers, the Islander’s AHL affiliate, making the AHL All-star team, leading all defensemen with his 12 goals at the midway point of the season. Unfortunately, Pulock was unable to attend as he suffered an injury and has missed some time since. There is no question he will be able to bounce back and pick up right where he left off, completing an impressive rookie campaign. Who knows, we may even see Pulock get a late season look with the big boys, as I’m sure the Isles brass is itching to see what his booming clap bomb can produce at the NHL level. What separates Pulock from the other defensemen in the system is his offensive ability, while still being a responsible defenseman. This makes him my top prospect as his game projects well at the NHL level, and barring a training camp competition, we may see the rookie professional stick with the Islanders. I do not want Reinhart’s position in the number two slot to be mistaken as any kind of negative sentiment toward him and his game. I am more than appreciative of the fact that the organization has two stud defensive prospects that will make for an entertaining competition come pre-season. If you asked me before training camp if Reinhart would be a full time defenseman on the Islander’s blue line, I would have said absolutely. However after the acquisition of Leddy and Boychuk, Reinhart saw his opportunity slip away. After his cup of tea with the Islanders at the beginning of the season, he returned to the Soundtigers and has played well. 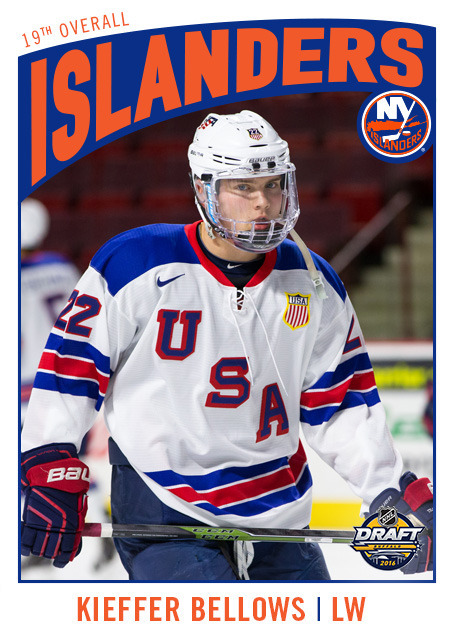 I think he showed flashes of a solid defensive defenseman in his stint with the Islanders, however he also showed his youth and I believe he will be better for the year he will spend with the Soundtigers. I voiced my concerns with Reinhart in my last column, however what I failed to address is by far the most concerning thing for me, his -11 is the team worst. I wouldn’t read too much into it yet as he isn’t playing with NHL talent. Reinhart will be competing for a spot next year and has just as good of a chance as Pulock with his leadership skills and size. Dal Colle is living up to the hype following being selected in the lottery at last year’s draft. The big winger plays a solid two way game and is scoring at a torrid pace to make him one of the best two way forwards in junior hockey. He is among the top ten in scoring in the Ontario Hockey League (OHL) and is leading the top ranked team in all of the Canadian Hockey League (CHL), which includes the OHL, Quebec Major Junior Hockey League (QMJHL), and the Western Hockey League (WHL). Night in and night out Dal Colle has been bringing his “A” game, playing like an absolute force. His talent projects well into the NHL game and barring catastrophe, I expect him to fill the hole on the John Tavares line within the next three seasons. He will get a much longer look at next season’s training camp, but I don’t expect him to crack the roster until the 2016-2017 season. Ho-Sang was the latter of the Islander’s first round picks in last year’s draft. He was one of the most skilled players available and might have been the most entertaining player picked. He is extremely confident and plays his game with the mentality that the guy in front of him has no shot at stopping him. His playmaking ability is impressive, which is evident as he’s racked up 44 assists so far this season, just 9 off his total from last season. I mentioned his lack of a goal scoring touch last week and he shut me up this week, racking up 3 goals and 3 assissts in 2 games. He is a game breaking type player that can break through and get hot at any moment and it really is fun to watch. He’s been given a pretty hard time for his “selfish” play, but I don’t buy it given that you don’t rack up 44 assists by holding the puck. His defensive game does need work, however he still projects as a skill player in the NHL. 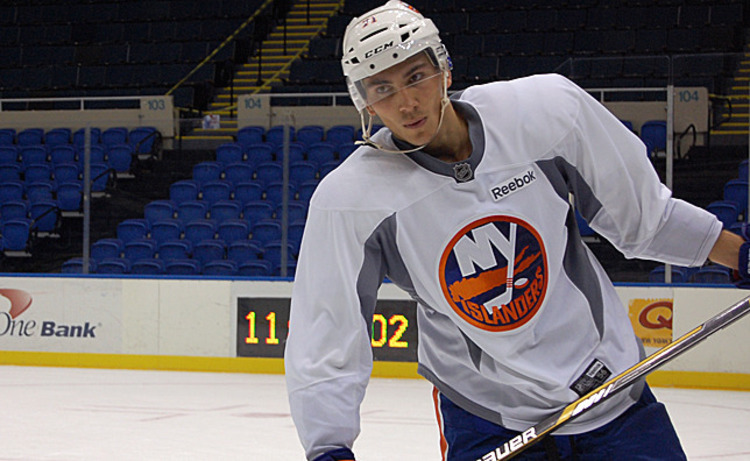 The game he plays is electric and he would fit in perfectly with this young Islanders squad. Expect him to reach the NHL during 2017 realistically. The fifth spot was a tough one given the depth at defense this organization has the luxury of having. I have always been a fan of Scott Mayfield because he is the stereotypical shut down, enforcer-type defenseman. He is a big guy, listed at 6’5” 220lbs and is not afraid to drop the gloves as we saw last season when he got a small stint with the Islanders in garbage time late in the year. He is not a flashy guy, but he gets the job done and that is why I think he will fight for a spot on the Islander’s blue line next year. He holds the other team accountable and will rack up tons of penalty minutes, but he is a very sound, stay at home guy. Think Matt Carkner size and toughness, but add the ability to skate. On an NHL blue line that is of average size and without a true enforcer, Mayfield has a chance to impress the Isles brass next offseason and compete for a roster spot. Sorokin was selected in the 3rd round of last year’s draft and has proven to be an exciting prospect for the Islanders. Fans had the opportunity to get a peak at his flashy style during the World Junior Classic which concluded just a few weeks ago. Although he served as a backup for the majority of the tournament, he still showed flashes of brilliance. He was the youngest goaltender in the Kontinental Hockey League (KHL) at the start of the season and still put up acceptable numbers despite being on one of the worst teams in the league. 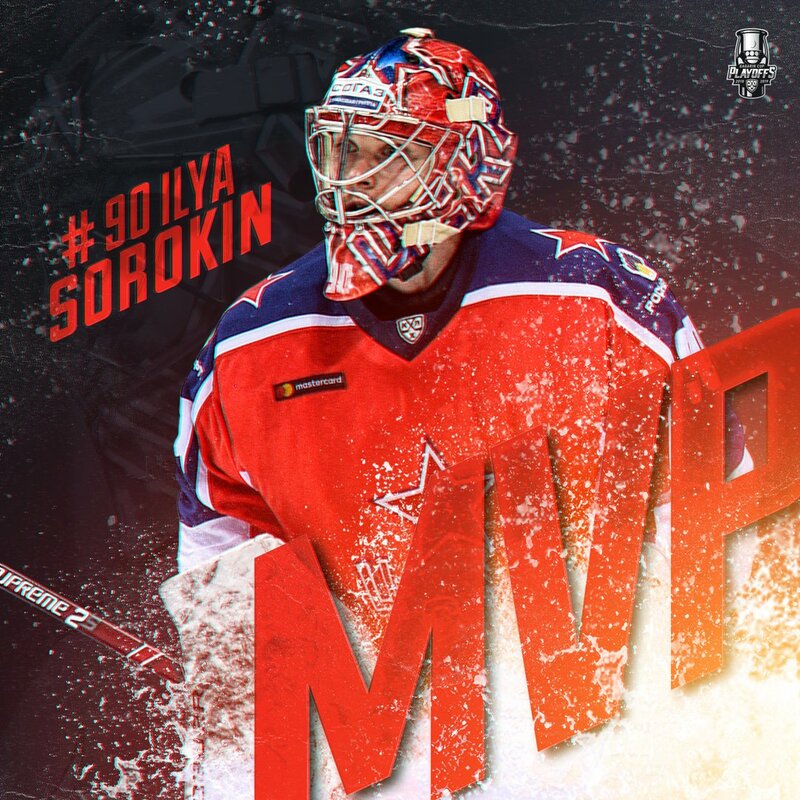 He was recently traded to the best team in the KHL (CSKA), which could be a blessing for Sorokin’s career but a curse for Islander fans as CSKA most likely plans to extend the young goalies beyond his current contract that doesn’t expire until after the 2016-17 season. The problem with European goaltenders is getting them to make the jump overseas to the NHL as Russian players especially tend to be comfortable playing in their own country. If he does make the jump, he wouldn’t be likely to do so until 2017. By then he would have more experience at a professional level than any other goalie his age, and I’m sure he’ll be talented enough to make a career in North America. 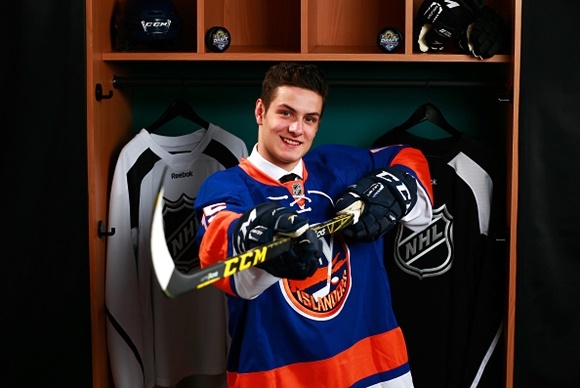 The Islander’s 4th round pick in last year’s draft rounded out a very good early round draft for the Islanders. The Swede has very good size and has played good hockey despite playing all over the place this season, appearing in the World Junior Championship with Sweden and being loaned out from his club not once, but twice. Unfortunately this week I’ve learned that he requires hip surgery and will miss the remainder of this season after finishing the WJC as the only goaltender to play all of his team’s minutes. He was one of the top goaltenders at the tournament on a team that seemingly ran out of gas following a red hot start. 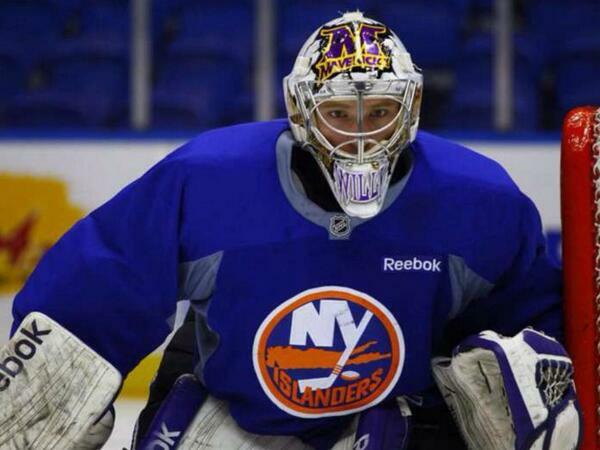 Provided he can bounce back from hip surgery, which is tough for a goaltender, he will be a solid prospect for the Islanders and is more likely to make the move to North America than top prospect Ilya Sorokin. Williams is by far the most underrated goaltending prospect in the organization by far. Playing for a surprising 3rd ranked NCAA Mankato Mavericks, Williams has played his way into a spot on this list. The WCHA isn’t the best conference in college hockey but Williams has played against and beat plenty of ranked opponents in non conference games, so that argument has become irrelevant. He had a very impressive freshman campaign racking up awards including WCHA Rookie of the Year, Goaltending Champion, and All-WCHA First Team. He had a bit of a sophomore slump, losing the starting job, but has surged back to take control again in his junior year and hasn’t looked back since, leading his team to a very impressive season, and his best since his rookie campaign. He is likely to sign with the Soundtigers following the end of his collegiate career in 2016 and given his work ethic will attempt to prove that he can be a backup goaltender at the NHL level.